It’s been about a month since we moved our family into our new home. Our second move for the year, this one was a bit easier seeing as most of our things were already packed. Settling into the new home, however, has been a bit more difficult for us. We’re getting there though… slowly but surely! Unfortunately, with everything we have going on I think my original plan of opening my etsy shop up by the end of the month is going to have to be postponed. In the mean time, I’m going to be sharing more of my new (and some not so new) projects. This particular post would fall in the “not so new” category. 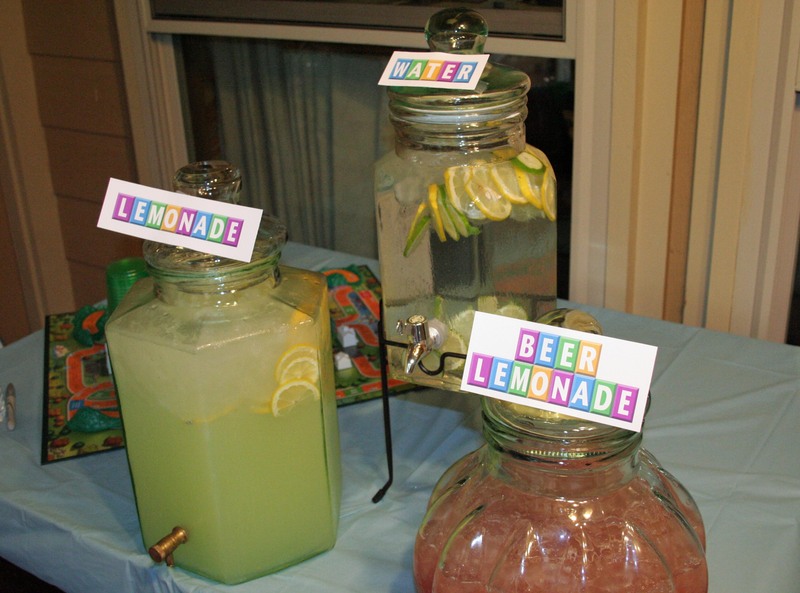 A little over a year ago I had the pleasure of co-hosting a couples shower for some very dear friends of mine. Bridal showers involving the guys are always a little tricky (they can be such complainers! ), so we tried our hardest to find a theme that didn’t just scream bridal shower. The result? 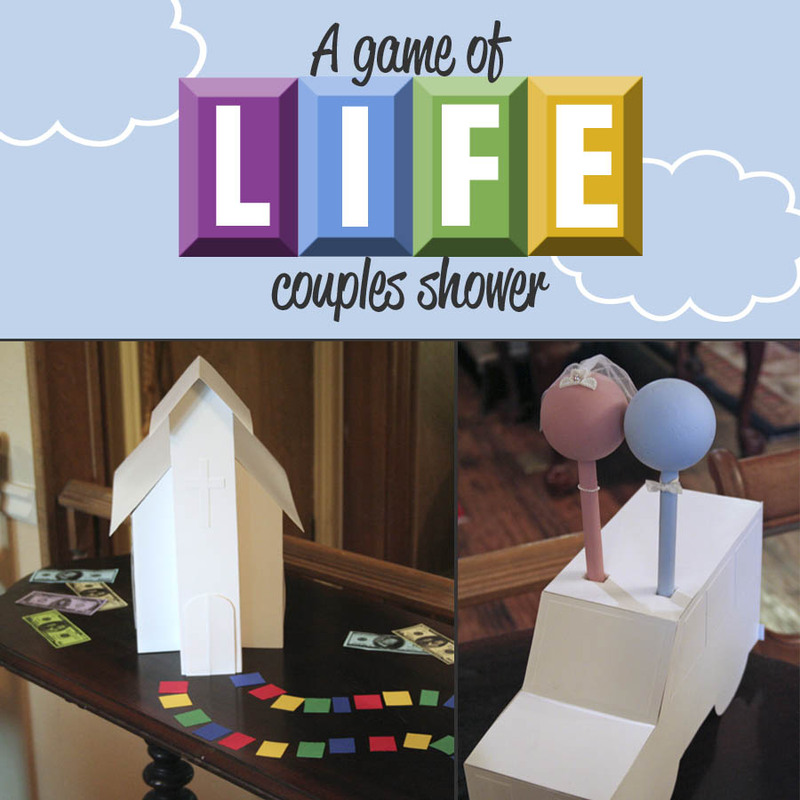 A Game of LIFE shower! None of us had played the game in ages, so we had a bit of recon work to do. 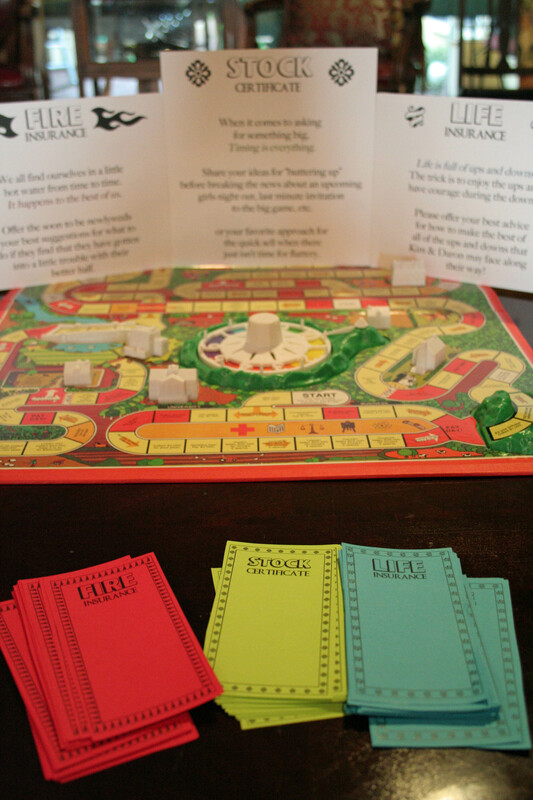 Luckily one of my co-hostesses knew several families who were gracious enough to let us borrow their games. After a few days of research and planning here is what we came up with! The invitation. Mostly, anyway. 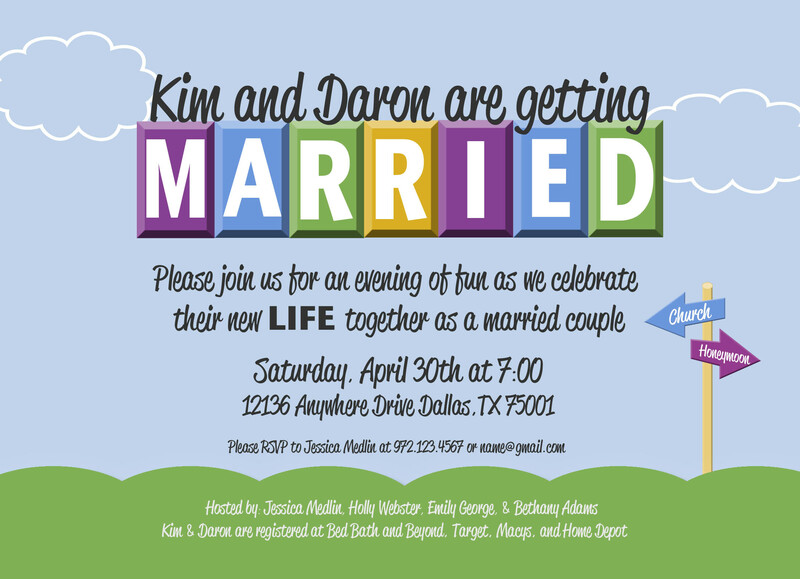 The actual design of their invitation was slightly different, but very similar to this one. 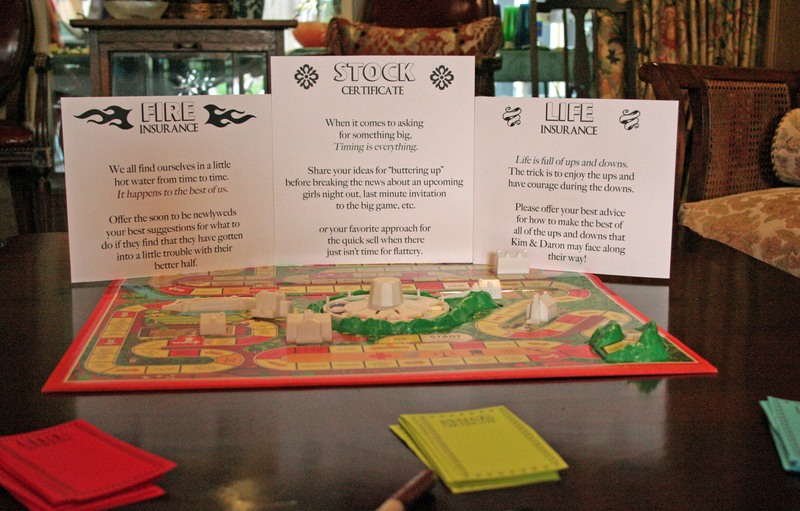 We created larger versions of the game pieces to decorate with. It took a bit of planning (and a lot of scotch tape), but I was so excited with how they turned out! The game pieces were made of white cardboard that I bought at the grocery store. The bride and groom were made out of dowel rods and floral foam from the craft store. I think the veil could have been a little bit larger, but this was a small pre-made veil that came with a pack of bridal stickers from the scrapbooking aisle. Couldn’t beat the convenience! 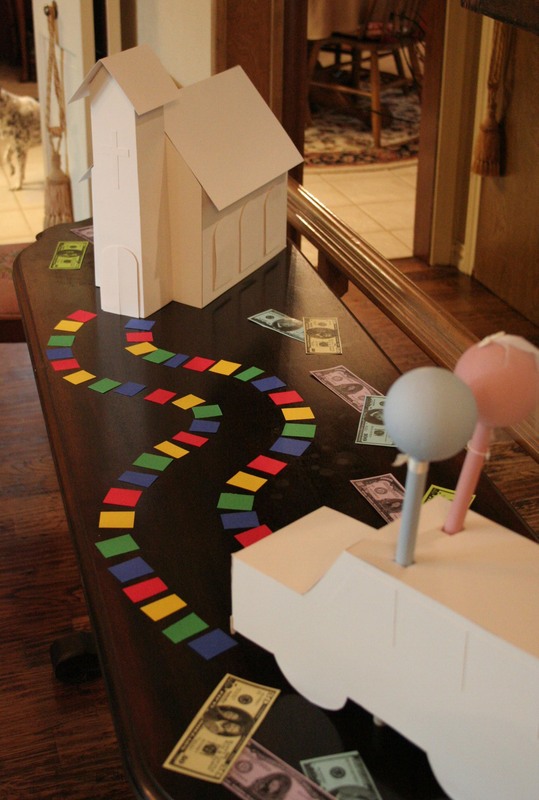 We set them up near the buffet, and created a “road” using some extra construction paper that we had on hand. We also set out some of the “money” that we created using some photos of the happy couple. We also used the game itself as decoration. I think we had about 5 of them out in various locations, as seen here next to the drink station! Instead of a traditional shower game, we created “certificates” inspired by the game that people could use to write notes and leave advice for the couple. Here’s a close up of the certificates. The “Fire Insurance” certificates were people’s advice for how to get yourself out of hot water. The “Stock Certificate” was for advice how to build up goodwill just before you need to ask for something big. And the “Insurance Certificate” was for advice on how to make the best of all of life’s little ups and downs. It was really fun to do something a little different! Everyone seemed to have a really great time… even the guys! This entry was posted in Wedding Showers and tagged Bridal shower, Bride, Couples Shower, Game of Life Shower, Showers and Parties, Weddings by My Running Leap. Bookmark the permalink.